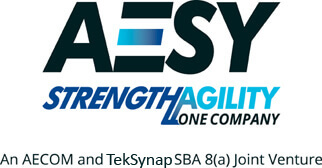 TekSynap announced today that it has formed AESY LLC, an SBA approved (8a) Mentor-Protégé Joint Venture between TekSynap (Protégé) and AECOM (Mentor). AECOM is a leading US Federal Government contractor with an extensive network of offices across the US and in more than 150 countries worldwide. AECOM combines the provision of industry-leading information technology (IT) solutions and services with internationally known, successful support of mission-critical programs in the defense, nuclear, space, and transportation sectors. The TekSynap-AECOM AESY Joint Venture is an 8(a) partnership that offers more than the sum of capabilities of its partners, providing small business responsive and innovation alongside depth of experience and resources. This combination of strength and agility are optimal to meet a wide array of IT and other services for our Federal Clients including network services, enterprise services, unified capabilities, computer network defense services, cloud technologies, engineering, telecommunications, wireless technology, network integration, audio visual/video teleconferencing (AV/VTC), and professional services and program management.